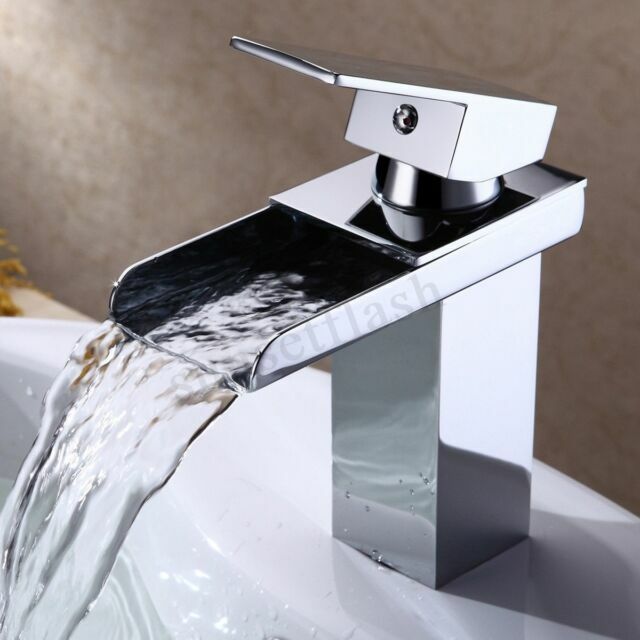 Bathroom Sink Waterfall Style Faucet. 1 X Waterfaull bathroom basin mixer Tap. Sub-Type Monobloc Mixer. Tap Typ Single Handle. Flow Rate 1.8 GPM (6.81 L/min). This Waterfall Basin Square Mixer Tap features an open-spout design which delivers a steady stream of water and plenty of impact. A single lever handle allows for easy engagement and adjustment of temperature, while the compact overall size makes it an ideal choice for smaller bathrooms or en-suites where basin space is limited. A quality brass body ensures this tap holds up well to corrosion. Got this beautiful waterfall square tap to coordinate with our new square style sink and unit. It does look amazing. Very modern and elegant. Excellent quality, and excellent value for money. One word of advice though. It's a tall tap. So unless you have a LARGE hand basin, be aware that water can splash against the front of the hand basin and over you and the edge of the sink If you put it on too forceful. My new hand basin isn't awfully big, not cloakroom size either though, and because the tap is so tall, you have to turn it on gently. It's stunning though, wouldn't change it for the world. Love it. Design flaw. No slope so leaves a puddle on tap at the mouth of flow. Remains all night Builds up limescale. I like this tap. A good weight easy to install and a nice finish. I didn't use the waste as I wanted a square edge one to complement the tap. Flow rate is great Keep the filter clean if you have hard water.